Saturday the final borders were put on En Provence — post coming soon. Sunday, I got the binding on the Blue Disappearing 9-Patch. Yes, with the exception of the blue, those are recycled fabrics from shirts I’ve picked up at garage sales and thrift shops. I still need to clip threads, make one, maybe two pillowcases then wash the whole thing before it’s ready to be delivered. But in the meantime, I’ve pulled out the UFO which was supposed to be a Christmas 2015 gift. I’ll have to sort through this pile to see where I left off. My goal is to get this quilt finished by the end of February. Hum…just over 3 weeks. We’ll see. This blue Disappearing 9-patch might just become my 1st finish for January and the year. I finished quilting it yesterday afternoon. Diagonal lines through the squares and then horizontal and vertical lines through the middle of the blocks. There is one more edge to trim, then it will be time to bind. Ha! I feel like I’ve got nothing done the first 6 months of the year. I know I haven’t finished anything on the Finish-A-Long list. But as I started thinking of what I HAVE accomplished, it’s not as bleak as I thought. In February I finished the Blue Disappearing 9-Patch top. Early March found me making this monochromatic tablerunner as a class sampler — which still needs to be quilted. Late March was a mad dash for a shop sample. – No picture. April and May I worked on the blocks for Alletore – the 2015 Bonnie Hunter Mystery. While doing these quilts, I made progress on the Tumbler Leader/Ender project – finishing it unless I decide to add a couple of more rows. It roughly measures 70 x 80. I also finished the backing to for the Disappearing 9-Patch. Progress was made on both Strip Twist & Pineapple Blossom. Now here’s a finish. These are 10 of the 17 bags I made for gifts. I didn’t get a picture of the rest of them. Another finish is this travel iron tote. And since I got into my Maypole fabrics, I decided to make a Bionic Gear Bag to go with it. It is still in progress. There may not be any finishes which count toward the Finish-A-Long, but I did more than I thought. 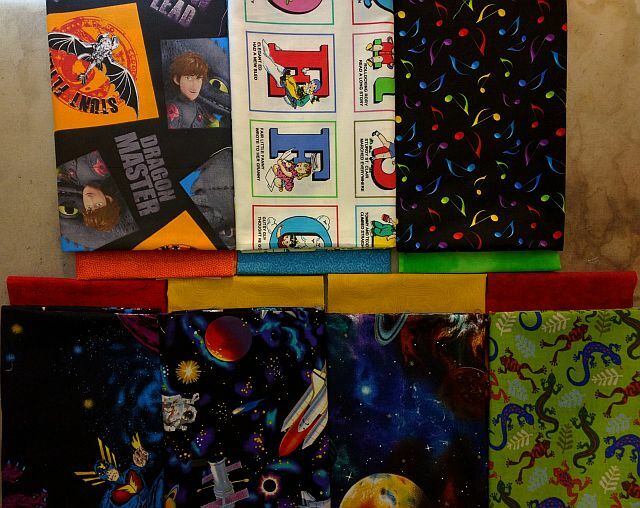 Shelly, over at PrairieMoonQuilts is hosting the 7th annual Final Countdown. 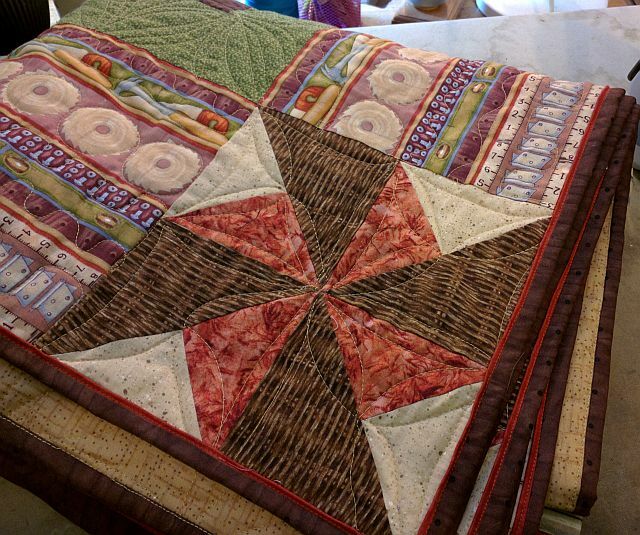 It’s a chance to do a few things in your quilting space to get you ready for the new year. I’m not sure how long I’ve been participating, but whatever the challenge, it’s usually something which needs to be done in my space. 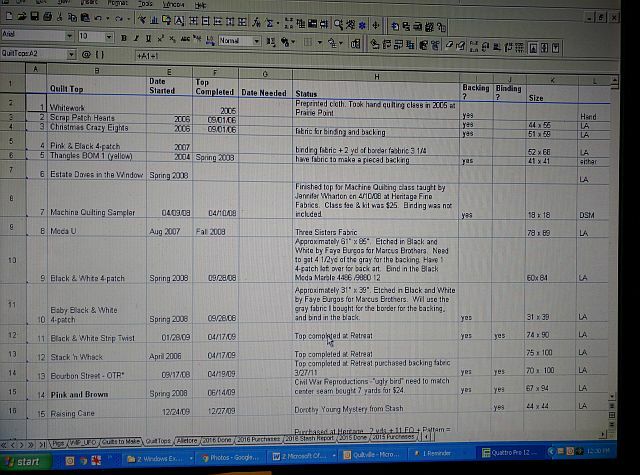 This task is easy for me — as I’ve been tracking them since 2009. I’m now down to 30 quilts in progress and 23 quilt tops. 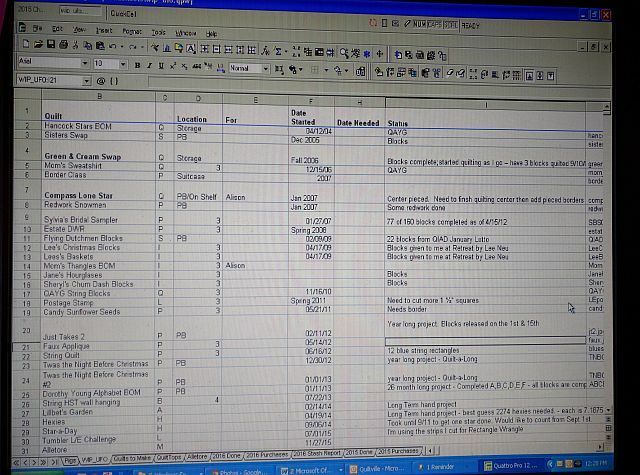 I have a spreadsheet with multiple tabs. 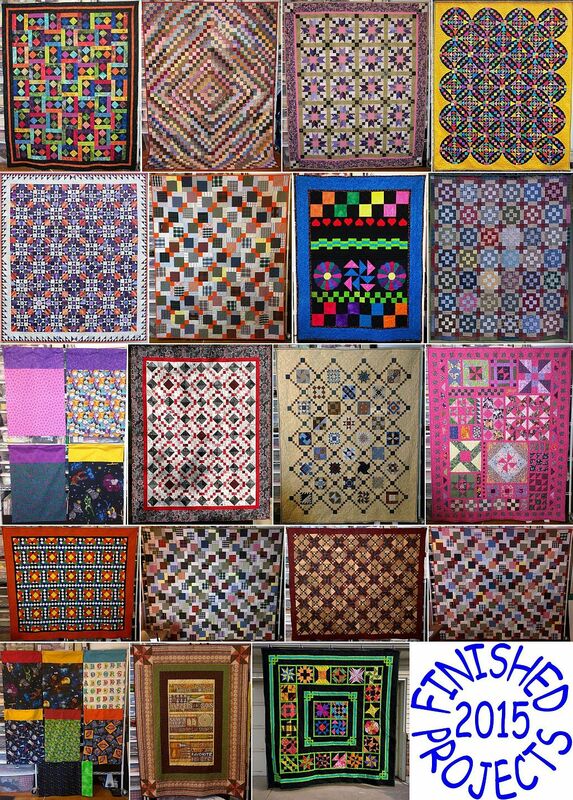 One tab lists the quilts in progress. The WIP_UFO tab lists each project, a code for the current status/type of project (C – still cutting, Q – Partially Quilted, P – Still Piecing, S – Swap Blocks, L – Leader/Ender Project, B – Needs Borders, H – Hand Piecing, A – Applique Project, I – Inherited Project), where it is stored, who it is for, when I started it, when I need it and a few notes. Another tab contains a list of all of my quilt tops. It lists the quilt top name, when I started it, when it became a top, when I need it, a few notes, whether or not I have the backing and binding, what size it is and how I plan on quilting it. The tops are in two boxes. 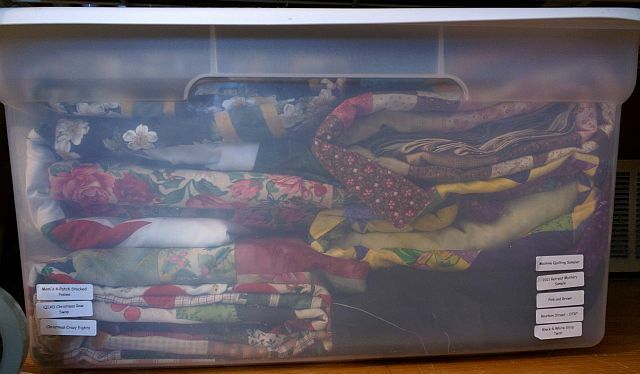 The box on the floor contains the tops which have quilt backings. The box on the top shelf are those which need backings. This past summer I culled my UFOs. 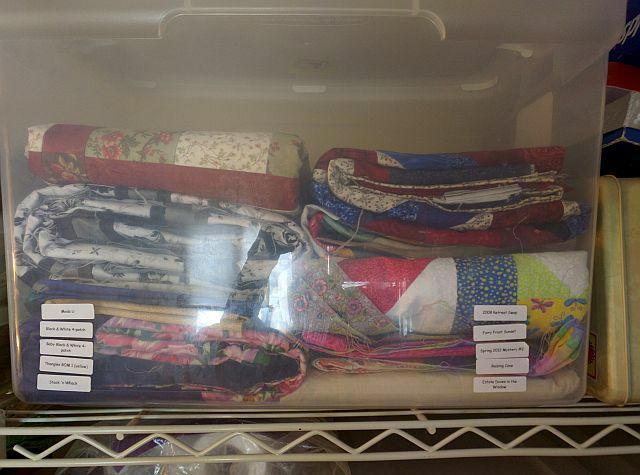 At least one BOM only had a few blocks made, so the fabric was put back into the stash and the blocks into the Orphan Block Box. Two sets of blocks were used together to create a couple of donation tops and a couple of tops waiting for borders or to be quilted were re-worked to a size for donation. So, my UFO/Tops are in pretty good shape. I guess that sends me back to Task # 1. I thought I would use this last Design Wall Monday post of 2015 to recap the projects that I’ve worked on this year. The pictures above are all of the quilts and a couple of groups of pillowcases not associated with quilts that I finished this year. 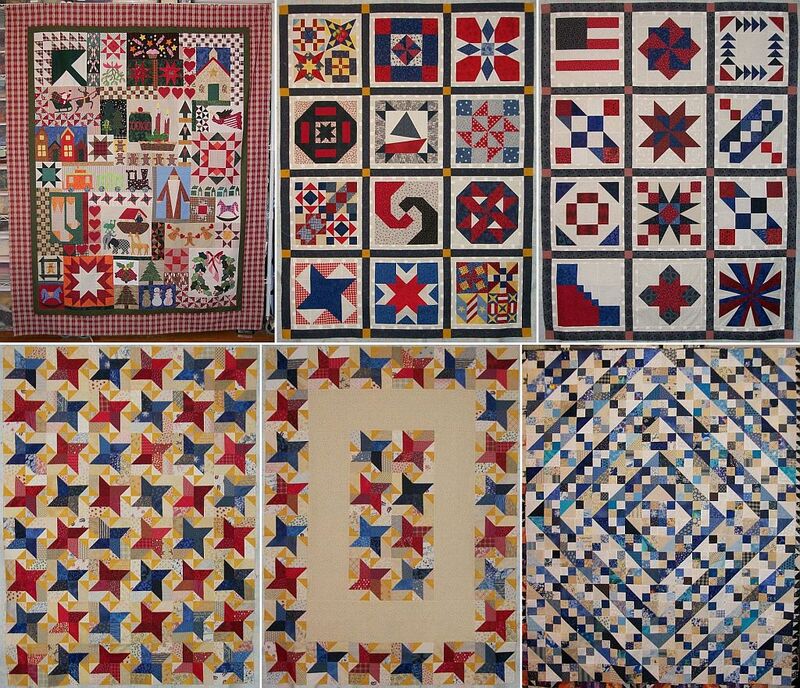 In addition to completely finishing the quilts pictured, I reworked and/or assembled the following tops. My leader/ender project for the year started with the postage stamp quilt, which is nowhere near complete, then in July, I started the Tumblers, which also has a way to go. My hand project – Star-A-Day I kept up with through March. I have 113 stars, so I’m about 1/3 of the way to completion. Additionally, I started Allietare, the Bonnie Hunter Mystery, although I’ve not gotten very far on it. 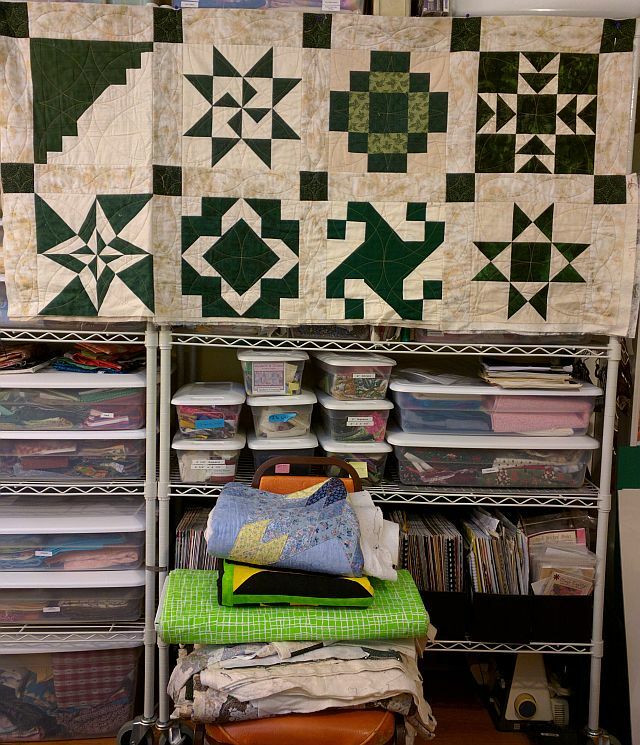 I worked a bit on the Green & Cream Swap Quilt. I’m afraid I handed out an IOU for a UFO for Christmas. 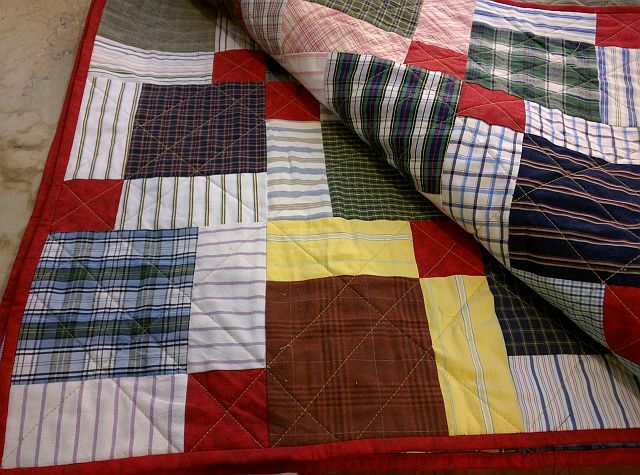 It will be the first quilt I complete in 2016 — right after I get my machine back from getting cleaned. It’s developed a squeak that I don’t like. But before I take it in, I will finish one last quilt. I still have a bit of repair work on the 4-Patch Stacked Posies. 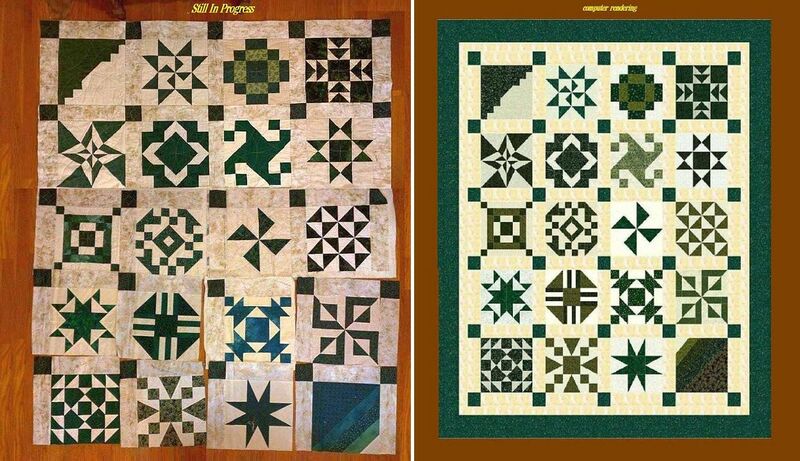 Check out what others are working on by following the links over at Patchwork Times. This is Black & Bright. The blocks were from a May 2007 swap I participated in. The blocks then sat for several years waiting for inspiration. 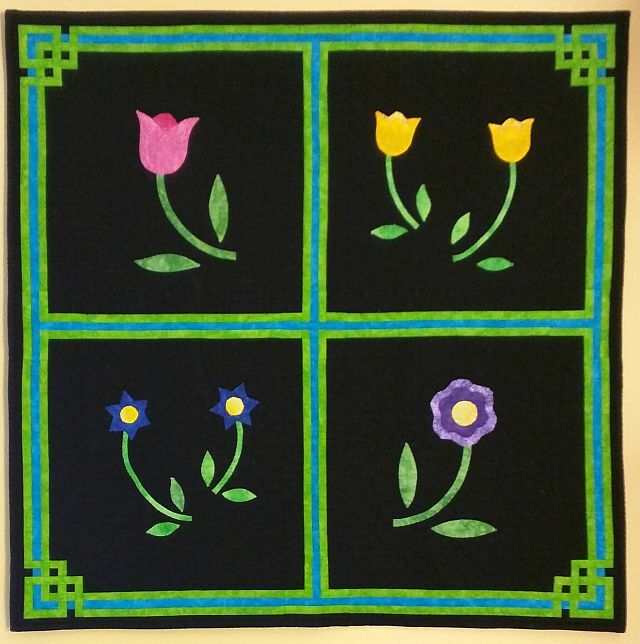 At one point I wanted to set the blocks with applique (yes, I know I say that’s a 4-letter word) flowers. I went as far as taking an on-line class to learn applique and quickly decided that wasn’t going to work. So, I took the class blocks and made this wall hanging in 2010. I didn’t like the original border with the wall hanging, so came up with this layout with the plan to use it on the quilt when I got that far. The quilt top finally got finished in April 2013 at a quilt retreat. It then sat in my stash of quilt tops to be quilted. This summer it was on of the quilts that was picked to be quilted as a thank you for the help in the yard (Aiming for Accuracy, Orange Crush and Nifty Thrifty were the other 3 quilts). 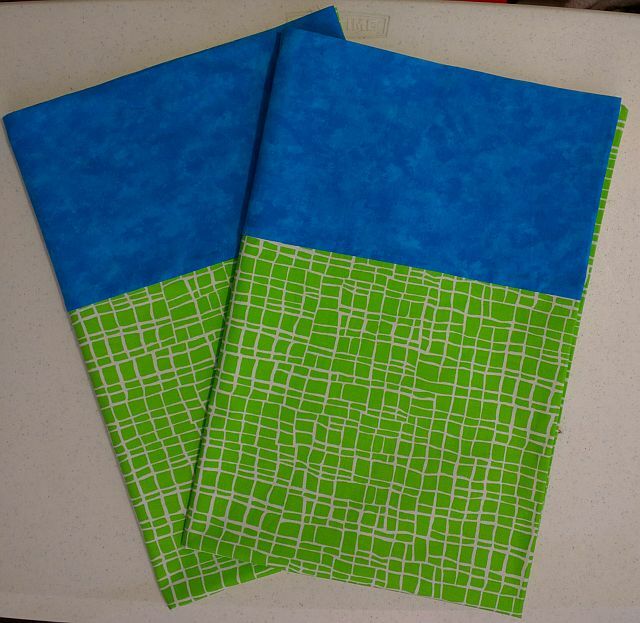 I found a bright green fabric on clearance to use for the backing. I also used it as the body of the pillowcases. 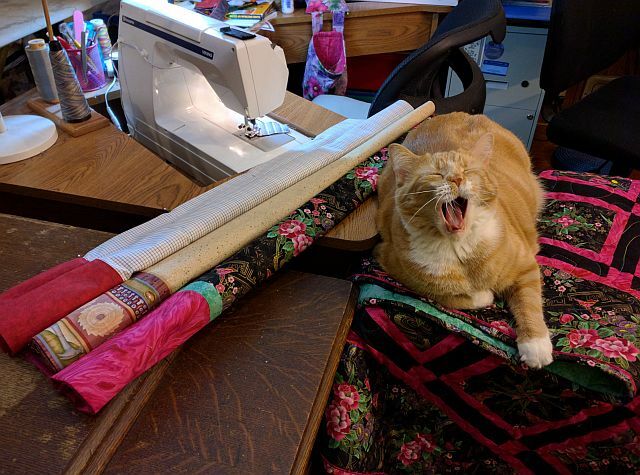 It was quilted on both the longarm and my DSM. I had a plan for the black borders and quickly realized I wasn’t able to execute it well — especially in the bright variegated thread I was using (Superior’s So Fine #40/3 in Crickey!) So came home and ripped out the top border and did a simple cable. It was either Wednesday night or Christmas Eve morning I realized that I wasn’t going to have enough thread — I was using Crickey! in the bobbin as well. So, I had a design opportunity. The ‘inner’ black band between the pieced border and the blocks is narrower than the ‘outer’ black bands, so I did a simple diamond in those two borders and used black thread on the top. Finally in the turquoise of the pieced borders I did a simply s-curve and used turquoise thread. I think I have less than 1/2 bobbin of Crikey! left. 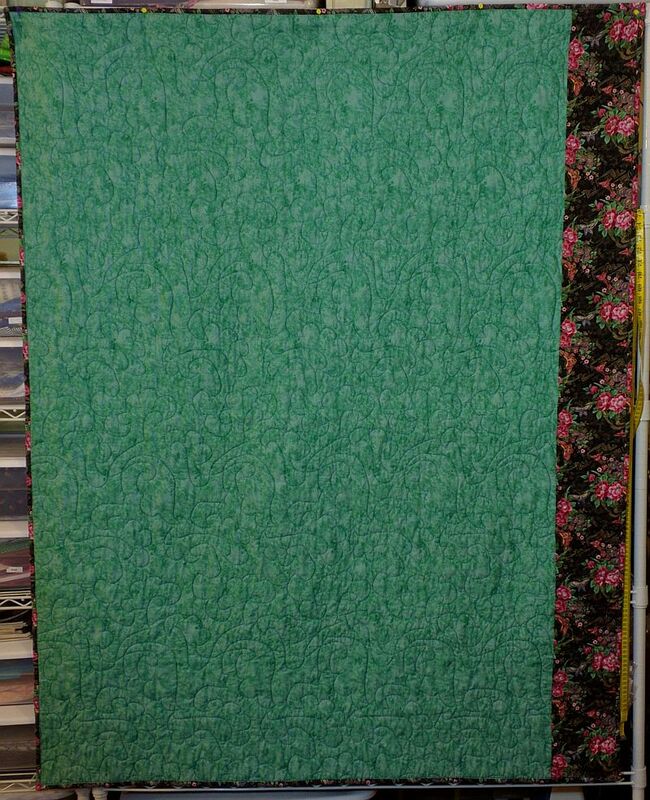 I picked the green from the border to repeat in the binding. “Susie’s Magic Binding” is my go-to binding when I need to do a fast binding. There’s no pinning and the entire thing can be done on the machine. I used Hobbs’ Heirloom 80/20 black batting in the quilt. It started out at 103″ square and after washing it measures 98″ square. It was finished Christmas Day, just in time to leave for Christmas dinner. It was part of my Crazy Challenge II and on the 4th Quarter Finish a Long list. The design wall proper is empty, but the Crazy Challenge II is progressing. The Red Disappearing 9-Patch is done. It just needs washing and photographing. I’ll wash it as soon as I get the pillowcase made. The hardware quilt is done. I’m so glad I couldn’t find the extra backing fabric. I love the pop of red. I need to get this quilt labeled and it will go into the wash when I finish the pillowcase. BTW I finally found the extra backing fabric. I had decided it was too dark for the neutral box and not dark enough for the brown box and it ended up in the yellow and Halloween box. 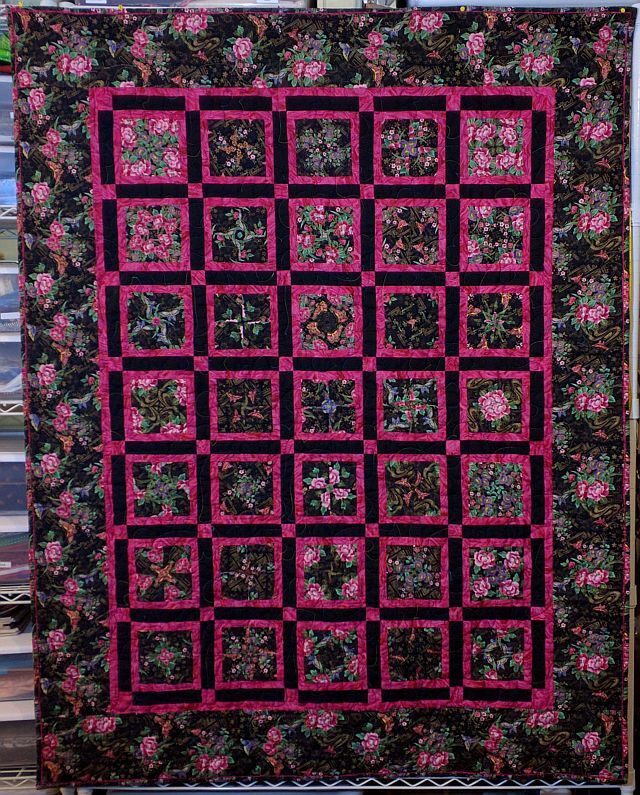 This Black and Pink 4-Patch Stacked Posies quilt is a hug quilt. I need to finish cleaning up the threads, make the label and finish the pillowcase, then it will go in the wash. I think Butterscotch is trying to tell me something. I know I’ve stopped for the night. The pillowcases will be finished up this evening. 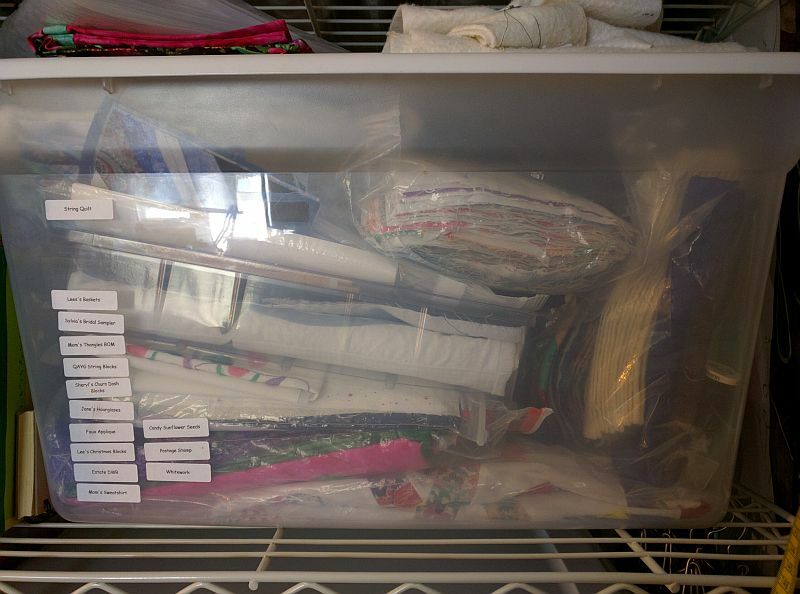 I re-evaluated and realized I needed two more pillowcases for a total 7 not associated with quilts. These are cut to size, but before I can put them together, the inside of the cuff will get a label and I need to make two more labels. Maybe Tuesday? 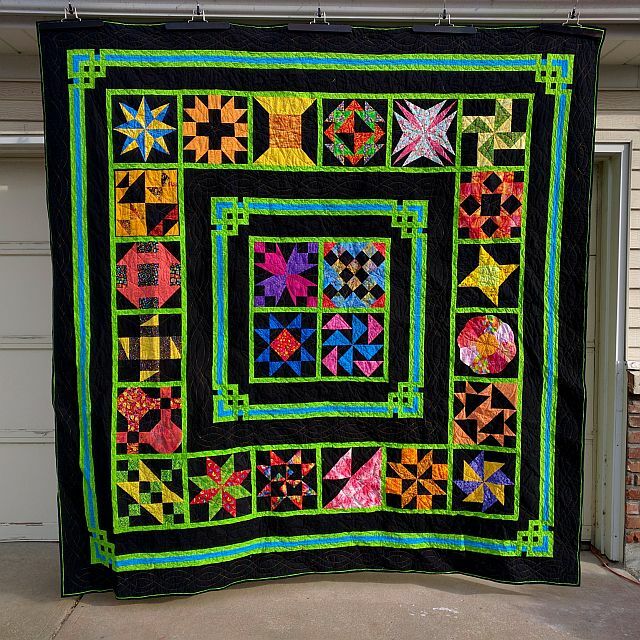 That lime green needs to be made into a backing for the Black and Bright quilt. The quilt needs to be put on the zippers and I have to figure out how I’m going to quilt it on Saturday. That’s got to be Wednesday’s project. The Cream and Green hanging to the shelves and under the lime green needs to be finished, as does the Compass Lone Star on top. They will need labels and pillowcases of course. I think these two will be necessity get pushed to next week. And the mystery quilt? I think I printed off the instructions and put them with the fabric — but at this point, I’m not sure. But clearly there is no more work on it until after the first of the year, and possibly not until February. 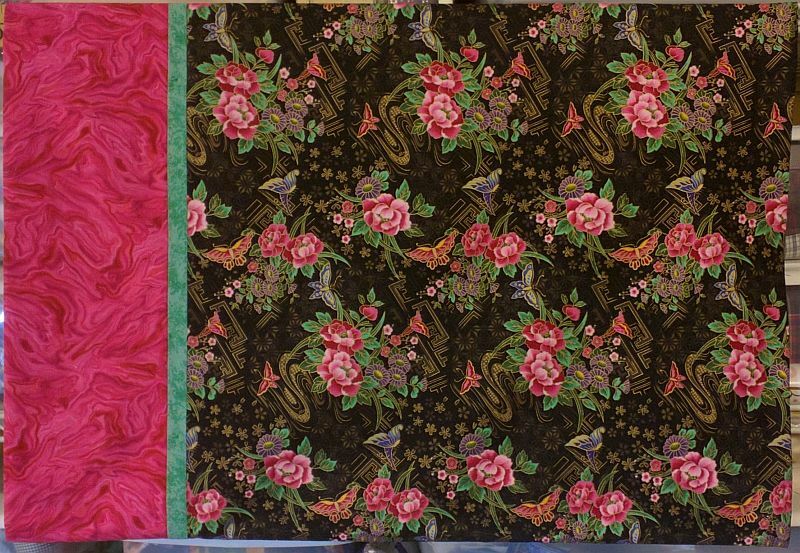 I’ve been given two commissions for quilts which need to be done in January. If you don’t hear from me, you’ll know why. I’m buried under quilts! Check out what others are working on over at Patchwork Times.